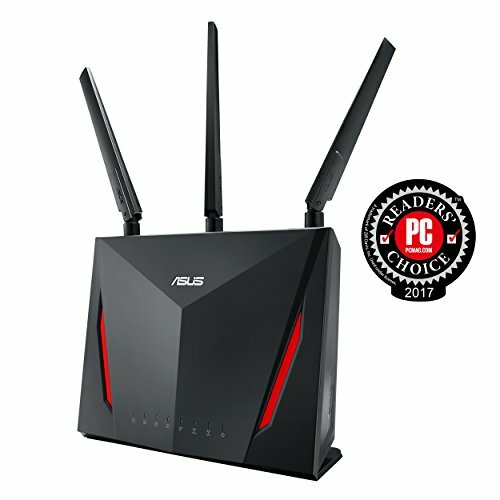 If you want a reasonably priced router that has it all, the Asus RT-AC86U checks very nearly all the boxes. From gaming to security to fast speeds, everybody can find something amazing to like about this high-end dual-band AC2900 wireless router. And for merely $200 (£200 in the UK, which converts to AU$350), you can get exactly what you need. It works extremely well and has a lot to offer. It won’t disappoint if you need an easy-to-use router with reliable Wi-Fi coverage in a large home. The Asus RT-AC86U is very sleek, presenting typically black look with two red streaks across the front. It stands vertically with three detachable antennas, only few status lights, and generally a compact design. You cannot put it down flat, or it can’t be mount on a wall, but at 1.9 pounds and 8.6 by 6.3 by 3.3 inches, it can be out of sight. On the back side, it has a power button, reset button, power adapter socket, USB 2.0 port, USB 3.1 Gen 1 port and a helpful LED on/off switch. There is also one gigabit WAN port and four gigabit LAN ports, one of which can be utilized for dual-WAN to connect a second internet connection to the router for improved Wi-Fi stability. The side of this router features a Wi-FI on/off button and a WPS button for promptly connecting new devices. The front LEDs are tiny and not very disturbing. They signify LAN ports 1-4, internet connectivity, 2.4GHz band, 5GHz band & power. Overall the design is very stylish, but like other routers, it probably will stand out if you place it in plain view. Try to keep it in a central location of your house. When it comes to specifications, the Asus RT-AC86U only lacks tri-band capabilities (means not having an extra 5GHz band). The dual-band AC2900 router offers 750Mbps on 2.4GHz, 2,167Mbps on 5GHz and a 1.8GHz processor. NitroQAM technology (1024-QAM modulation) is what makes this router stand out from its competitors. It has 4×4 (four transmit antennas and four receive antennas) capability on 5GHz and 3×3 on 2.4GHz, so combined with NitroQAM, it offers speculative speeds that are 1.25 times that of a 256-QAM router, like the Asus RT-AC87U and the Netgear Nighthawk X4 AC2350 router. The QoS features give you effortless access to prioritizing your network traffic. You can use the adaptive QoS automatic settings to prioritize specific types of traffic like games or streaming, or you can set it yourself that which traffic and devices get priority. There is also usual QoS to restrict bandwidth. Gamers will benefit from the one-click LAN boost which automatically organizes games to no. 1 on your network. This router even comes with a free of charge two-week trial of Gamers Private Network (GPN), sponsored by WTFast. This service will robotically select the most competent route for your game packets. After the audition, you will need to pay $10 per month if you want to keep your subscription. Asus also included its commercial-grade security, AiProtection, with the RT-AC86U. Asus and Trend Micro provide devices with extra protection from malevolent attacks and viruses. AiProtection monitors entire network to ward off attacks as well as neutralize any devices that may get infected. You also have right to use parental controls to limit access to certain sites on your devices. It’s uncommon that you see a router with such concentration paid to both safety and gaming, but this one does seem like the complete package. As the increasing popularity of 5GHz Wi-Fi devices, RT-AC86U has an extra internal 5GHz antenna to give the ultimate 5GHz quad-stream performance, while Range Boost significantly improves mid to long distance Wi-Fi coverage. Additionally, its first-class 1.8GHz 64bit dual-core processor brings its computational potential to the next level, allowing USB data transfers of up to 110MB/s and router download/upload speeds (WAN-LAN throughput) of up to 1600Mbps2. MU-MIMO technology allows router to connect to various devices and concurrently provide data streams to each at their top speed. In fact, it can connect to multiple MU-MIMO-compatible clients at each device’s maximum speed simultaneously, unlike standard single-user MIMO where individual devices have to wait for sequential transmissions. With ASUS novel antenna design and the latest Range Boost technology, both Wi-Fi range and signal stability get better dramatically. AiRadar further focuses Wi-Fi signal on your devices, making Wi-Fi faster, clearer and stronger. Powerful Whole-home Wi-Fi System. The Way You Want. In most cases, RT-AC86U can deliver smooth, reliable Wi-Fi to every part of the house but Wi-Fi coverage can be distracted by many factors such as room layout, construction materials, and even furnishings. ASUS AiMesh is an innovative new router feature that solves these problems: it creates a whole-home Wi-Fi network using several ASUS routers. AiMesh is flexible, powerful and you can use a mix of ASUS router models. It gives you time-saving central control and flawless roaming capability. AiMesh is Wi-Fi you can rely on for all your devices, all the time! Installing the RT-AC86U is easy and quick. Connect the router to the cable modem and desktop PC, then open a browser, and type: http://router.asus.com in the address bar. This launches the Setup wizard, which lets you through the internet and wireless process. One can also skip the wizard and configure these settings manually if you wish. Afterward, wait a few minutes while the router updates its firmware and there you go. You are going to get maximum features for your money with the Asus RT-AC86U AC2900 Wi-Fi router. With a price tag of just $200, you get high-end features like MU-MIMO, advanced traffic prioritization, USB 3.1 and dual-WAN. And with extras like GameBoost and AiProtection, the Asus RT-AC86U is perfect for anyone looking to improve their home network. Also if you want a robust gaming router while keeping to a lower budget, this is an excellent choice. It is a speedy and competent router with a complex firmware made more penetrable by sensible user-friendly design and a quick setup process. It also has gaming-centric features, security for your entire home and USB 3.1 Gen 1 for fast network storage and printing. Plus it has the little extra feature disabling buttons on the case which is a small thing, but very useful. The aggressive design of the case and its inflexible form factor won't be for everyone, and for all its tooltips the extent of Asus' firmware is probably way exaggerated for most. While the UK and US prices are very reasonable, the markup in Australia is a bit much. Also, it’s only dual-band, so it lacks an extra 5GHz band to ease network congestion.